The horses’ feet clop upon the stone road as the carriage rocks along, the sound of conversation echoing from its confines out into the quiet countryside. It is 140 BC. The Roman nation is nearing the apex of its affluence and power. Death, discouragement and defeat during a brutal series of wars are now a distant memory. Conquest has brought wealth, luxury and ease to the once hard-pressed Roman people, especially the politicians and businessmen, transforming the nation from an agrarian to a commercial society. Two brothers, Tiberius and Gaius Gracchus, are traveling together through the Roman countryside on their way to the capital, talking and taking in the mild Italian spring. They see many things as they travel along the Via Apia— great Roman edifices and aqueducts, passing groups of Roman soldiers patrolling the roads, couriers carrying messages to and from distant cities, and rolling expanses of Italian land, fertile and inviting… yet seemingly empty of Romans. Derelict homes dot the landscape, punctuated by the occasional massive mansion surrounded by far less lavish, barracks-style buildings, housing for the slave gangs captured in wars with Spain, Africa and other nations. The slaves mill about the estates, planting and picking, but few Roman citizens are to be found. At most, Tiberius and Gaius glimpse an occasional Roman supervisor, a servant of some senator or patrician who has taken up residence and ownership of the vast Roman countryside. A dark quiet falls upon their chariot ride towards Rome. When Tiberius and Gaius reach the capital, they find the missing Romans. Hundreds upon hundreds of Romans—landless, purposeless and unemployed. As they make their way through the city, the brothers see their fellow citizens hanging around taverns and bars, drinking and gambling, waiting dejectedly in the government-provided breadlines, or picking fights with Roman soldiers in the streets. The once productive and self-sufficient farmers or workers in small local communities are now displaced and draining the resources and vitality out of the cities and country. The similarities between Rome right before its fall into dictatorship and modern America are striking and disturbing—debt, political gridlock, breakdown of the family, inability to deal with external and internal problems—to mention just a few. For us, the particular issue at hand is how the rise of ancient agribusiness, known as latifundia, from latus, “spacious,” and fundus, “farm or estate,” and the loss of the yeoman (that is, small) farmer contributed to the nation’s decline into internal disarray and eventual dictatorship. For centuries, the yeoman farmers served as the backbone of the Roman economy, morality and military. They sustained the nation’s people with food through hard work and wise husbandry, steadied the populace with their virtue and morals, and supplied the army with distinguished and dedicated soldiers who kept the nation secure from internal and external threats. Following the wars with Carthage and the subsequent wealth it brought to certain Romans, more and more of Rome’s land was turned into these latifundia, the forerunner in many ways to modern, industrial farms both here and abroad. Wealthy senators or their patrician friends owned these large farms, which were worked by slave gangs. The owners often exerted considerable power in and over the Roman political system, manipulating and at times even paralyzing the senate and government from dealing with the nation’s problems. The small yeoman farms and their workers could not compete against the slave gangs of the latifundia and were forced to abandon their homes and property to seek employment in the cities, decimating the small, rural communities that once filled the Italian countryside. The loss of the small farms resulted in more and more people flowing into the already crowded cities. These rootless newcomers helped drive up unemployment, crime, vice and the need for government handouts, all of which further strained the nation’s resources and finances during a time of mounting external and economic pressures. As people left the countryside, more and more land became available for the latifundia to acquire creating a terrible cycle of low commodity prices forcing population displacement, followed by urban overcrowding and decay, and finally to even greater burdens on the Roman cities and government. Rome went from a nation of many small, independent, and self-sufficient landowners to a nation controlled by a few rich and powerful “landlords,” with large portions of the population trapped in government-supported poverty or latifundia slavery. Two young men, the Gracchi brothers, sought to check the growth of the latifundia and restore the yeoman farmers. The older brother, Tiberius Gracchus, became a tribune of the plebs in 133 BC . 2 Circumventing the senate, he brought directly to the people legislation to restore public lands—lands that were often illegally owned or occupied by senators and wealthy businessmen—to the poor, landless Roman citizens. While the people overwhelmingly supported and passed his measure, the senate blocked the financing needed to carry out the mandates of the bill. Tiberius again bypassed the senate, funneling the bequest of the king of Pergamum to provide the needed financing for his reforms. When he sought reelection as tribune his adversaries, under the pretext that he was seeking to become king, incited a mob to kill him and many of his supporters. Gaius Gracchus was not deterred by his brother’s demise. However, he decided that only a dictator could remedy the political gridlock and powerful special interests that now controlled the Roman government. Having learned from his brother’s mistakes, he first sought to gain broader popular support among Rome’s other classes for his reforms, to counteract the strength of the senate and special interests, by securing land for small farmers, courting the special interests with favorable laws, providing food and clothing for the poor and offering citizenship to Rome’s allies. Within one hundred years of the deaths of the Gracchi brothers, the Roman Republic would become the Roman Empire under Octavian Augustus Caesar and the people’s ability to govern themselves would be irrevocably lost. The political gridlock fueled by the wealthy and powerful special interests coupled with the apathy of the general population would create an open door for a dictator—in the name of the people and the common good—to gain complete control over the whole nation. America was a nation built upon and around small farming communities, though not without some debate among the founders. After the industrial revolution and World War II, small American farms found themselves in an all too Roman-like situation, but only far worse. 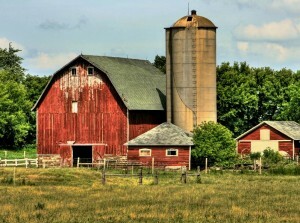 Over the next sixty years, everything from the slave labor wages and working conditions of industrial farms and factories to overseas imports from places like China, Mexico, and elsewhere, (where rules, regulations and requirements for fair wages, decent working conditions and pollution are minimal to non-existent), would drive out the small, local, American farms. Moreover, agribusiness had evolved, moving beyond mere slave labor to a vast array of chemical and biological weapons and expensive but powerful fossil fuel-guzzling machines, furthering their competitive advantages against the small farmer. A government policy of “get big or get out” would help galvanize a nation seemingly bent on the loss and destruction of its lifeblood under the guise of improvement and progress. Today, powerful and well-funded agribusiness uses its political clout to manipulate politicians and public perception, all while seeking greater power over the global food system. Industrial farming practices, where the true costs are externalized on uninformed and ignorant consumers, give the appearance of low prices. none of the real costs—polluted land, poisoned water, air barely breathable, horrifically abused animals, the scourge of modern diseases and physical degeneration—appear on agribusiness accounting ledgers. Migrant or illegal workers have replaced the Roman slave gangs with little improvement in compensation or working conditions. CAFOs, vast monocultures of genetically modified corn and soy, and a host of other abominable farming and food production practices have replaced the old Roman slave barracks and store houses. Even worse, the companies that employ such practices are sometimes able to secure immunity from the most basic of environmental laws and traditional taxes in the name of economic development and progress. How such atrocities against planet and people can be called development and progress boggles the mind. We now find our nation’s economy in disarray, our cities riddled with crime and disease, while our countryside has been abandoned to either neglect or abuse by chemical and machine intensive monoculture farms, concentration camp-like confinement farming facilities, or wealthy resort-like castles, where tens to hundreds of acres of Roundup-manicured grass are mowed rather than mooed year after year, wasting valuable agricultural space and fossil fuels for the sake of a select few. World hunger skyrockets in the face of rising commodity prices fueled by an economic system hooked on grain and gas like a drug addict on crack. But our industrial agricultural appetites have begun to catch up with us. Agribusiness is a symptom of a sick and sickly society. It is like a chronic infection or cancer that must be dealt with before a person can ever hope to return to vibrant health. It is now time to deal with the problem here in America and abroad and it begins, not with a call for dictatorship or radical social upheaval and revolt, but with each of us buying locally, helping pass legislation that benefits and protects our nation’s small farmers, and educating others to do the same. Personal, family, community and national health start with our decision to buy local and put nutrient-dense real food on our dinner plates. Let each of us choose wisely and encourage others to do the same. The office of tribune was established to protect the rights of the plebeians against the patricians and thus to provide a check against the powers of the primarily patrician Roman senate. Ten tribunes were elected each year and they were sacrosanct (that is, protected from harm) during their term. By custom, they were only allowed to serve as tribune for a single one year-term. The tribune occupied a potentially powerful role in the Roman political system. For instance, through the power of veto, a tribune could bring the entire government to a complete halt and override the decision of any other magistrate. He could lay legislation directly before the people, bypassing the senate. Unfortunately, few tribunes during the waning of the republic used their power to protect the liberty of the people, often using the office instead as a mere stepping-stone to greater power, influence and wealth on their way up the cursus honorum, the Roman political ladder. Thomas Jefferson, third president of the United States, was a staunch defender of small farmers, broad based democracy, agrarianism, and limited government in his debates with more industrial minded, aristocratic, bureaucratic men, such as Alexander Hamilton. His words, penned hundreds of years ago, are even more pertinent and poignant today. Agriculture… is our wisest pursuit, because it will in the end contribute most to real wealth, good morals and happiness. Cultivators of the earth are the most valuable citizens. They are the most vigorous, the most independent, the most virtuous, and they are tied to their country and wedded to its liberty and interests by the most lasting bonds. As long, therefore, as they can find employment in this line, I would not convert them into mariners, artisans, or anything else. The United States… will be more virtuous, more free and more happy employed in agriculture than as carriers or manufacturers. It is a truth, and a precious one for them, if they could be persuaded of it. The way to have good and safe government is not to trust it all to one, but to divide it among the many, distributing to everyone exactly the functions in which he is competent. . . To let the National Government be entrusted with the defense of the nation, and its foreign and federal relations . . . The State Governments with the Civil Rights, Laws, Police and administration of what concerns the State generally. . . The Counties with the local concerns, and each ward direct the interests within itself. It is by dividing and subdividing these Republics from the great national one down through all its subordinations until it ends in the administration of everyman’s farm by himself, by placing under everyone what his own eye may superintend, that all will be done for the best. Primary Source: Plutarch, Lives of Tiberius and Gaius Gracchus, translated by John Dryden. Secondary Source: Rufus Fears, Famous Romans, The Great Courses. The Teaching Company, 2001. The above introduction is a fictional story, yet rooted in the general historical situation and circumstances of the Roman nation in the 150’s-120’s BC, created to help the reader gain a general feel for the characters and context of the article as a whole. It is important to note that patrician and plebeian did not necessarily mean rich and poor, powerful and powerless, though in general the plebeians were the lower, poorer classes while the patricians were the upper, wealthier classes in Roman society. Some plebeian families enjoyed great wealth and influence, while some patrician families over time fell into poverty and obscurity. For this material and much of the historical material throughout this article, I am indebted to Dr. Rufus Fears and Dr. Bob Luginbill. The historical knowledge was their gift to others and me; the synthesis of that knowledge is my gift to them and others. Dr. Fears’ general summary of an ancient principle, which still applies to America, is that “A balanced constitution and civic virtue would bring with it success (empire) which would bring wealth and contact with foreigners, and undermine civic virtue, the foundation of liberty,” Famous Romans, The Great Courses. The Teaching Company, 2001. For a researcher who shares this same general viewpoint, see Raj Patel, Stuffed and Starved: The Hidden Battle for the World Food System. For more general information related to industrial agriculture, see Richard Manning’s book, Going Against the Grain and “The Oil We Eat,” Harper’s Magazine. Accessed April 21st, 2008 http://www.harpers.org/archive/2004/02/0079915. This article appeared in Wise Traditions in Food, Farming and the Healing Arts, the quarterly journal of the Weston A. Price Foundation, Summer 2008. John Moody is the founder of Whole Life, a buying club in Kentucky that carries local WAPF-friendly food and ecologically sensible products. He has helped start or train multiple other buying clubs around the country, along with writing, researching and speaking for various journals and events in his region. Is Agrarianism Just for Hippies?